After 45 Years A Dream Nears Reality | Peter M. Schloss | J.D. - Mediator. How I came to read the July 1974 issue of National Geographic is lost to me. Perhaps it was in a barbershop chair. Perhaps it was in a dentist’s waiting room. How is not so important as the context of the time. July 7th I had arrived in Kansas City a recent graduate of Southern Illinois University. I was scrambling to rent an apartment and making preparations to report for work on the 15th as a newly hired Missouri State Parole Officer. A few weeks later I would meet a young lady named Christine. 3 years later we would be married. Our relationship has since flourished for more than 45 years, as has the dream sparked by an article in that issue of National Geographic; “Exploring England’s Canals”. 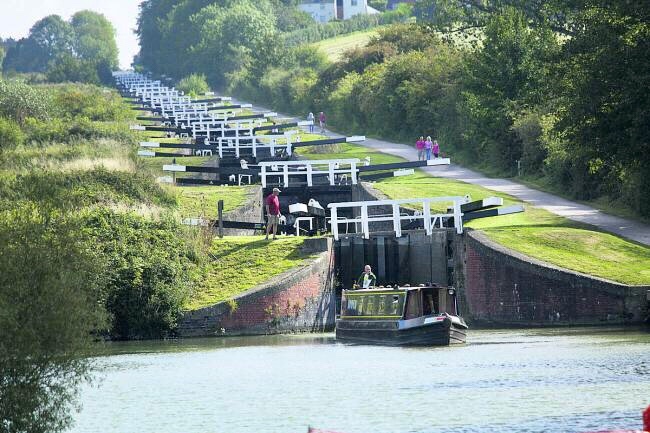 The story described a vast network of canals in England dating back hundreds of years. These canals had fallen into ruin but were slowly being restored and repurposed for recreational exploration. The self-powered barges, known as “Narrow Boats”, were similarly being restored. Holds and bilges that once carried coal and commerce were being outfitted with galleys, berths, and heads. For the uninitiated that translates into kitchens, beds, and toilets. The photographs of the verdant English countryside, meandering waterways, and the intrepid navigators piloting these craft became images burned into the retina of my imagination. I have held preciously to my love of Christine, and I have held tenaciously to the dream of one day becoming one of those canal boat pilots. In 3 weeks at a dock in Middlewich England I will be handed the keys to the Salten-Fjord, a 61-foot-long 8-foot-wide diesel-powered canal boat. It will be entrusted to us for 3 weeks. We will be joined for the first half of the charter by our good friend and Camino companion from 2013, Kris Ashton. The second half of the charter will be shared with our “doppelganger” friends from the 2018 Camino, Tom Shillington and his wife Nanci Burns. It is our hope that over the course of 3 weeks we will traverse 200 miles of canals, navigating scores of locks, water viaducts, tunnels and drawbridges. Countless pubs and backwater dives will beckon, and I pray we will be up to the challenge. It is my intention over the next week to post information about this upcoming “adventure”, so please “stay tuned”! ← The End of Living, The End of Life. Go for it. England is where I get 38% of my DNA. Sounds like a great experience. Another chapter for the coffee table book! Hooray for you – safe travels! I look forward to your journal entries! Thanks babe! Maybe this will also become a coffee table book. Last year‘s book was epic at 202 pages! What a wonderful saying Pat. Thank you! i am envious about your upcoming adventure. When ever I traveled to England I would see the boats up and down the canals. I leave you with these Swedish words: “Refeber” – The restless race of the travelers heart before the journey begins…. Max, that describes my life! Pingback: 6 Weeks in England | an Overview | Peter M. Schloss | J.D. - Mediator.